Create a little animal magic and make this cute cake for a nature lover or gardener. I made it for my Granddaughters 4th birthday. Preheat the oven to 180C/gas mark 4. Grease the bowl then line the base with parchment paper. Sift together the flour and baking powder into a bowl. Add the margarine, sugar,and eggs. Beat well for a couple of minutes, add the food colouring, if using. Spoon the mixture into the prepared bowl and smooth the surface. Bake in the centre of the oven for 55 – 60 minutes. Leave the cake in the bowl for 10 minutes, then turn out onto a wire rack, peel off the parchment paper and leave to cool. Cut the cake in half horizontally and sandwich together with buttercream. Cut off about one-third of the cake and brush both pieces with lemon curd. Colour a little less than half of the fondant red. On a work surface lightly dusted with icing sugar, roll out to about 5mm/1/4” in thickness and use to cover the larger piece of cake. Using a wooden skewer or the back of a knife, make an indentation down the centre of the cake for the wing casings. Colour just over half of the remaining fondant black. Roll out three-quarters if the fondant and use to cover the smaller piece cake. Place the cakes on a cake board and assemble the head and body, gently pressing them together to secure. Roll out a little of the white fondant and cut out 2 circles for the eyes, using the 5cm/2” round biscuit cutter. Stick in position with a little water. Roll out the reserved black fondant and cut out 8 circles using the 4cm/1 1/2” round biscuit cutter. Stick one on each eye and the rest onto the body with a little water. Reserve the trimmings. Colour the remaining fondant green. To make the grass put a little at a time in the garlic press and squeeze through. Trim off with a knife. Brush the cake board with a little water and position the grass. To make the marshmallow flowers, roll the marzipan into a 2cm/1/4” long sausage shape and cut into thin slices. Set aside. On a work surface lightly dusted with icing sugar, flatten each marshmallow with a rolling pin. Snip around the marshmallow to make petals. Press a marzipan circle into the centre of each flower. Cover about 4” of the pipe cleaners with cling film and insert into the cake between the head and body, make a small ball out of the reserved black fondant and press onto the end of each one. 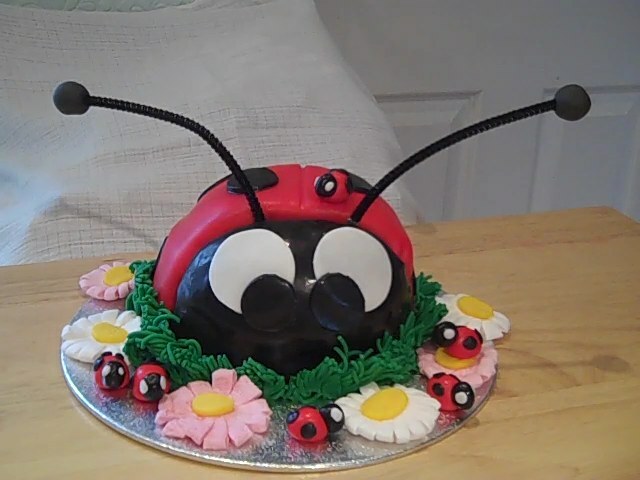 Arrange the ladybird decorations and flowers around the cake.